This article first appeared in Personal Wealth, The Edge Malaysia Weekly, on January 21, 2019 - January 27, 2019. Robo-advisory platforms have been gaining ground globally for their no-frills automated interface and low-cost investment management services. 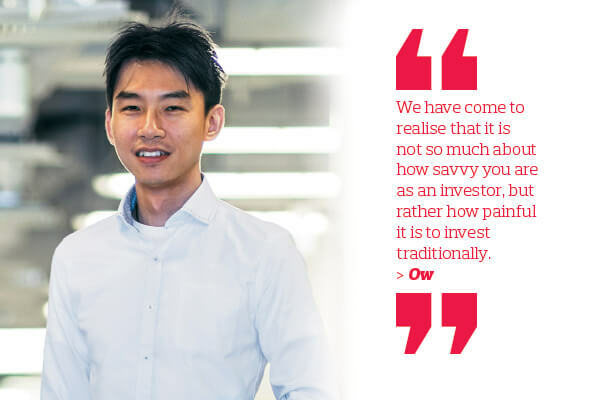 But in settings such as Southeast Asia, where these services are considerably novel, a model that combines automated services with those offered by human wealth managers work better, says AutoWealth Pte Ltd founder and CEO Ow Tai Zhi. He believes that a hybrid model works better in this region because there is still a strong emphasis on trust and people inherently have an emotional relationship with their money. “The unique thing about robo-advisors in the region is that they cater for the needs of the locals. For example, we find that Asians — when they intend to invest — want to know who the human is behind their investments or who they can call when the markets are turbulent,” he says. To cater for these investors, the Singapore-based digital wealth manager designs investment portfolios that leverage the advantages offered by both cost-effective robo-advisory modules and human wealth managers. Ow opted for this model as he felt that it would assure investors who wanted to know there was someone who could help them make rational decisions, but were devoid of strong emotions. “I have been in the fund management industry since 2006. I worked for Singapore’s sovereign wealth fund, GIC Pte Ltd, until the 2008 global financial crisis. Subsequently, I joined a hedge fund [managed by Kazim Asset Management Pte Ltd]. Then, I left to manage a family fund,” says Ow. “I used to get requests from family and friends to manage their wealth. But one night in March 2013, an acquaintance — whom I had got to know briefly at a bikers’ club gathering — handed over a cheque for S$200,000 on our second meeting and asked me to manage his money. “He was investing on his own, mainly picking stocks based on his own judgement. There were some wins, but they were mostly losses. He also invested in unit trusts through banks, but felt that he was paying a lot of fees for miserably low returns. While researching suitable avenues, he felt that setting up a robo-advisory firm would help him serve people for much less. “It became clear to me that as a human wealth manager, I could probably service only 20 to 30 clients at any given time. It was obvious that a robo-advisory platform would be the solution. If I built a platform that allowed anyone to come on board, it would allow me to serve more people,” says Ow. Ow set up AutoWealth in 2015. The platform began managing client funds the following year, after getting the green light from the Monetary Authority of Singapore (MAS). The platform currently manages more than S$10 million. Some 85% of its clients live in Singapore while the rest are from Malaysia, Indonesia, Hong Kong, Taiwan and Europe. AutoWealth portfolios are diversified across more than 8,000 global equities and 600 government bonds. These assets span four major geographical regions — the US, Europe, Asia-Pacific and emerging markets — as well as across all major industries. “AutoWealth portfolios are more defensive against any market turmoil than those that are concentrated in only one asset class. Diversification is also done cost-efficiently through index-tracking ETFs,” says Ow. The company initially expected mainly millennial investors. However, it now has a good mix of clients from every age group. Its youngest clients are 18 years old while its oldest is a 77-year-old retiree, says Ow. “I am guessing that this has to do with the pain points people face when it comes to investing. We have come to realise that it is not so much about how savvy you are as an investor, but rather how painful it is to invest traditionally,” he says. Most people are shut out from investing as they are not able to meet the minimum requirements to get started, says Ow. And even when they are able to invest, they have to endure low returns and high fees. On the other hand, AutoWealth charges an annual management fee of only 0.5% and a platform fee of US$18 to cover custody and transaction costs. Also, investors are allowed infinite number of deposits, withdrawals and rebalancing without additional fees, says Ow. But unlike some of its competitors, the platform requires a minimum investment of S$3,000. “AutoWealth has a minimum requirement of S$3,000 because each client will have a personal custody account. That means our investors’ assets are given individual custody accounts. So, if anything happens to the company, investors have full legal ownership of their assets,” says Ow. “Usually, robo-advisories that do not require a minimum investment amount tend to hold their client funds in a single account. That means if they suffer a cyberattack and lose their clients’ records, it could spell doom. Once investors come on board, they are assigned a wealth manager, who will guide them through the investing process. “The usual positive reviews that we receive from clients are that our wealth managers are just one WhatsApp message away,” says Ow. AutoWealth has applied for a licence from the Securities Commission Malaysia to offer its services here. Although the Singapore-based platform is open to investors from all over the world, it has received a lot of interest in having an office in this country. Ow points out that the company would be able to serve its clients here better by having a local presence. “Every month, we are seeing more clients come on board, although the scale is still very small compared with the potential size of the market, which is about 300,000 investors in Singapore,” he says. The platform’s financial advisory module receives and analyses the clients’ responses to questions about their financial goals, life cycle stages, income levels, investment experience and natural tendencies towards certain market behaviours. After that, the robo-advisor assigns them their risk profile — moderate, balanced, growth or aggressive. “Human wealth managers cannot overwrite the investor profile as the platform is more objective and unbiased. However, the human wealth manager may add value by giving personal or specific advice for unique circumstances,” says Ow. Up to this stage, investors can still back out from their intention to invest and opt to do it themselves. But most of the time, they proceed to invest with AutoWealth as it would be costlier and more of a hassle to do it themselves, says Ow. “For example, if I want to construct a portfolio of six ETFs, I need to open a stockbroking account. I also need to decide where I want to open this stockbroking account and screen what types of ETFs to buy, at what price and how much of each. Periodically, I will need to monitor the portfolio to see whether it is balanced and if there is a need to do any rebalancing. Once an investor commits his funds, the portfolio advisory module recommends a corresponding investment portfolio of exchange-traded funds (ETFs) based on his risk profile. It also shows the projected returns and risks to manage the client’s expectations and allow him to make a more informed portfolio selection. “The human wealth manager may then advise the client on alternative investment portfolios, let’s say, to adopt a more aggressive portfolio if it better serves the client’s needs. For example, a young client who has little investment experience but is prepared to take a higher risk. According to Ow, the rebalancing of portfolios occurs whenever markets are volatile. “Recently, the US stock market declined while US government bonds went up considerably. So, we sold government bonds and bought US stocks while they were cheap. Portfolios are rebalanced about five to six times a year on average,” he says. Using such strategies, the AutoWealth Balanced Portfolio — which comprises 40% government bonds and 60% stocks — registered a return of 18.5% net of fees and currency impact since its inception in May 2016 (as at September last year). “It significantly outperformed the median performance of global balanced mutual funds available in Singapore, which registered an average return of 7.8%,” says Ow. Despite the strong returns, 2018 was a tumultuous year for AutoWealth, just as it was for the global financial markets. The portfolios were not spared from the dread that the US stock markets underwent, says Ow. On Dec 31, the Dow Jones Industrial Average had lost 5.6%, the Standard & Poor’s 500 was down 6.2% and the Nasdaq had fallen 4%. “We ended the year with negative returns as well. Although US corporate profits were at their highest in 2018 and S&P 500 companies registered net profits of more than 10%, the markets were negative last year. Many find this strange as there had not been a single year where corporate profits grew more than 10% year on year but the stock markets became negative. There was no precedence for this,” says Ow. “But there is a good reason. If you look back, 2016 and 2017 were extraordinary because the markets did not suffer any material correction. By material, I mean more than a 5% decline in prices. “In any year, on average, we should have 2.93 times market correction [globally]. But in 2016 and 2017, there were none. This was truly extraordinary.